Partridge grey is an incredible contemporary colour which is totally on trend, offering a striking finish that is beautiful enough to stand out on its own, yet versatile enough to create the perfect foundation for a colour scheme of your choosing. That’s precisely why the Milbourne Partridge Grey is such an incredibly popular kitchen design currently available at Number One Kitchens, Manchester’s premium kitchen fitting service. 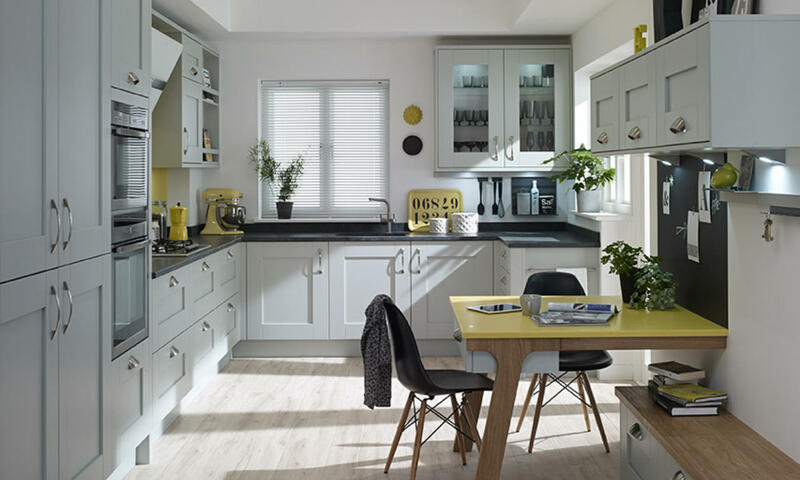 The Milbourne Partridge Grey contemporary kitchen is a wonderfully trendy kitchen design. With a gorgeous grey colour palette, this shaker style kitchen has optimum storage facilities within your kitchen, ensuring everything has a home and there’s a place for all of your kitchen goods and accessories. With a host of upper and lower cupboards within the Milbourne Kitchen design, you’ve got a gorgeous range of space to play with, creating a kitchen space which is perfect for families and couples alike. There’s a built in section for your oven appliances, accentuating your Milbourne Partridge Grey kitchen design with a slick and seamless finish. Curved chrome handles finish the shaker doors off in style, adding a modern twist to your gorgeous new kitchen. Clear glazed feature doors have created a feature point within the Milbourne Partridge Grey contemporary kitchen design pictured above, allowing you to showcase your favourite kitchen accessories in a stylish fashion. Open shelving is another opportunity to make your kitchen even more beautiful, showing off some of your favourite memorabilia or cookbooks perhaps. As with all of Number One Kitchens’ designs, the Milbourne Partridge Grey is completely customisable. You have 27 different matte colours to choose from, allowing you to opt for a vibrant colour pop to compliment your partridge grey foundation, or perhaps choosing a different colour scheme altogether. A dark grey work surface has been pictured here, adding depth to the grey colour palette at work. You can choose from a host of different finishes for your surfaces, creating a perfect place for food preparation and entertaining.